Sulfur is a by-product of processing natural gas and refining high-sulfur crude oils. According to US EPA most of the 68,000,000 metric tons of sulfur produced worldwide in 2012 was a by-product from refineries and other hydrocarbon processing plants (US EPA 2014). Sulfur is an important component of fertilizer, but also has many other industrial uses. The market for clean transportation fuels is growing and many of the world’s remaining hydrocarbon reserves are richer in sulphur than previously exploited fields. On top of this, the governments are imposing increasingly stringent limits on the sulphur content of fuels (Ye 2006). Therefore we see an increasing by-production of sulfur from the oil and gas industry. The sulfur demand is not able to keep up with the production and the sulfur supply is therefore not fully utilised. Some of the refineries face this “sulfur challenge” by storing and managing accumulating sulfur mountains on their properties under the regulations of the environmental authorities (Ye 2006). The sulfur market imbalance implies that this storage (a kind of waste treatment) is the marginal treatment. Additional production of sulfur leads to additional storage of these amounts, because the market for sulfur is already saturated. Additional use of sulfur leads to a similar reduction in the need for storage. Some new uses of sulfur have appeared, such as sulfur concrete, that may become the long term outlet for the surplus sulfur. 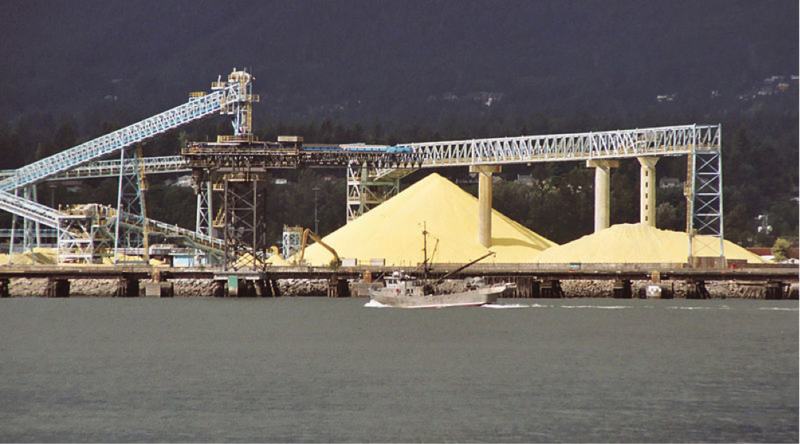 Figure: Large sulfur pile at North Vancouver, B.C., Canada. Foto credits: Wikimedia commons. Leonard G. 2005. Description of the current (and past) sulfur by-product processes and commodity surveys can be found on the US EPA webpages. Wikipedia is also good as a place to get you started. For the management of the sulfur “challenge” we in this example rely on a report from 2006 by Eric Ye from DuPont. US EPAb – Emissions Factors & AP 42, Compilation of Air Pollutant Emission Factors. Background report AP-42, section 5.18 Sulfur recovery http://www.epa.gov/ttnchie1/ap42/ch08/bgdocs/b08s13.pdf (accessed January 15. 2015). Ye, E 2006. Alternative Sulfur Management Solutions to Help Refiners Meet Clean Fuel and Environmental Challenges. DuPont Refining Solutions – Presented at The Sulphur Institute’s tenth biennial International Sulphur Market Symposium, on April 4-6, 2006 in Beijing, China.